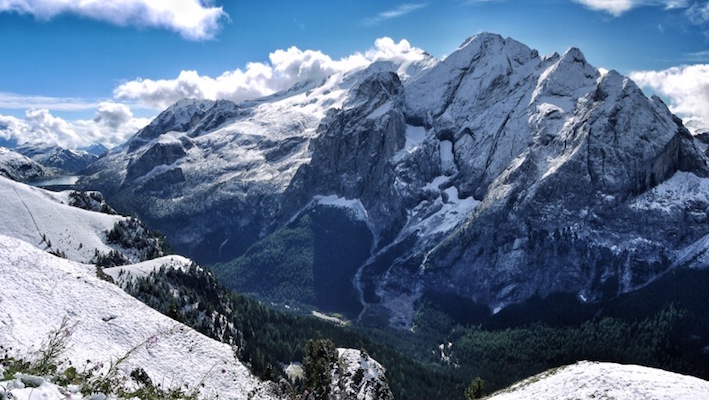 To get this shot of the Marmolada, one needs to walk from the Pordoi Pass, up a popular path to the Rifugio Fredarola, more than a kilometre and 150 metres higher, to the south. The view is, however, a reward for the 30 minute excursion. My photograph above was taken standing right next to where the Fredarola Hut stands today. It would not have been there in Zardini’s day. I was unfortunately not able to make my 2011 visit in the late afternoon/early evening light that Zardini clearly enjoyed. The big northern slopes of the Marmolada and Gran Vernel were largely in late morning shadow, for all my efforts. All three photographs above show the WWI slit trench that runs across the hillside just below the viewer. 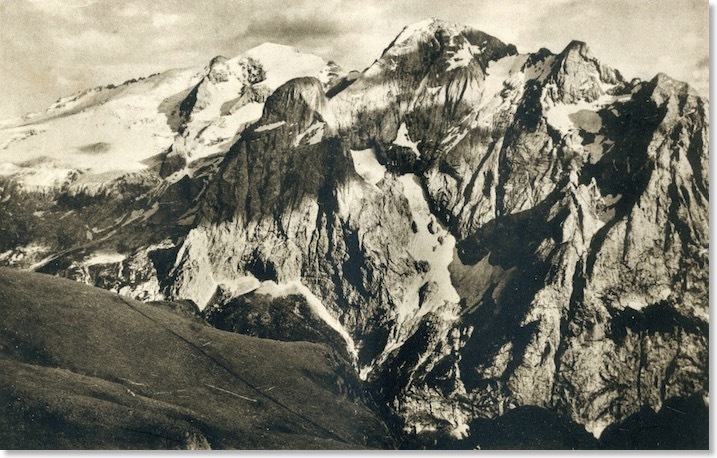 A comparison of my own photographs with Zardini’s also underlines the extent to which the Marmolada glacier has retreated in about 90 years. Zardini uses this photo in both guides to the Road. And why not? This is a view of the highest mountain in the Dolomites, after all. 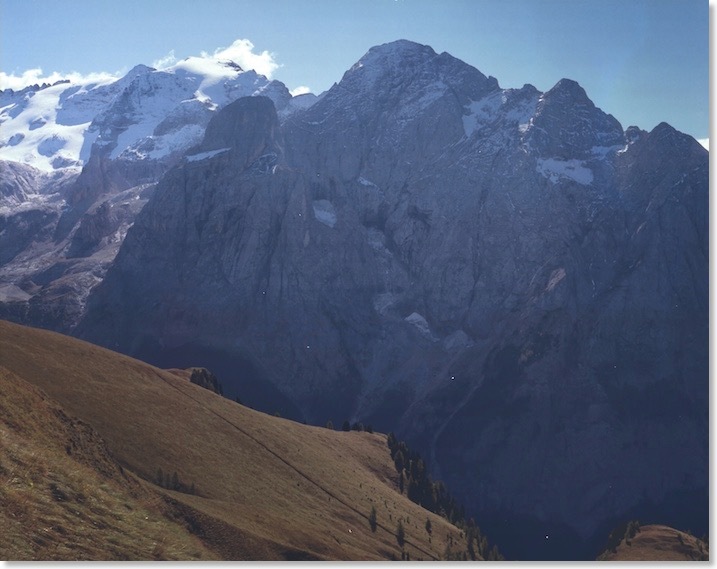 I’ve commented elsewhere on this web site about the extent of competition in the first half of the 20th century between Dolomites postcard producers. 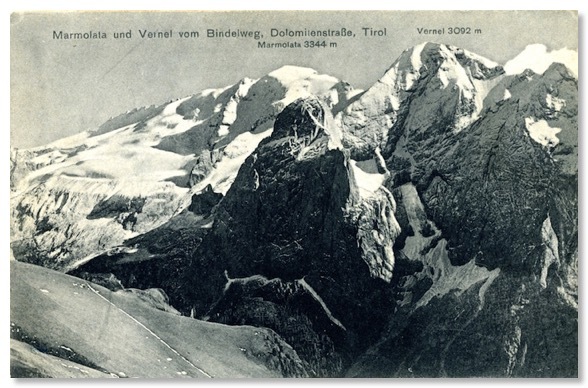 This is well exemplified by this postcard, by Werth of Toblach, from the late 1920s or 1930s. Given all of the great viewpoints available for the Marmolada, they nevertheless chose one very nearly identical to that Zardini used. Or maybe it was the other way around?